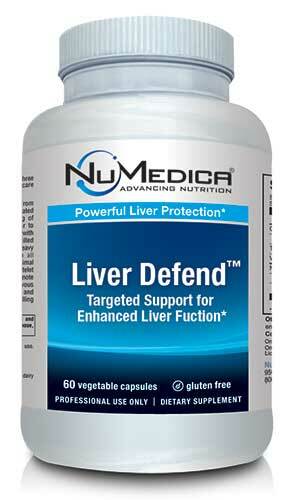 NuMedica Liver Defend-60c is available in capsule form, and delivers four key ingredients to guarantee enhanced liver protection and defense. 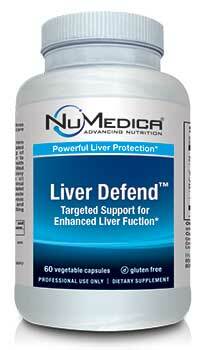 Liver Defend contains NAC (N-Acetyl Cysteine, which synthesizes glutathione that serves as a detoxification agent in the body, as well as Alpha-Lipoic Acid, a powerful antioxidant responsible for preventing cell damage while ridding the body of harmful toxins and substances, make Numedica Liver Defend such a powerful supplement in support of healthy liver function. When it comes to eliminating toxins form the body, the liver is on the front lines of that battle, and NuMedica Liver Defend-60c is there to help win that war. The human body tasks the liver with a great number of functions including removing waste, producing necessary biochemicals to aid with digestion, and regulation of glycogen storage in the body. Since there is no way to compensate long-term for failed liver functions, it is crucial that the liver stay as healthy as possible. Towards that end, Liver Defend-60c delivers vital support to this important organ in support of proper liver function. Regular use of Liver Defend helps in maintaining healthy liver function because it contains targeted nutritional support aimed at achieving enhanced liver protection. Containing N-Acetyl Cysteine, a necessary forerunner to the creation of glutathione that acts as a detoxifying agent in the body, Liver Defend provides that added layer of protection. To ensure that cells are not damaged owing to the presence of toxins in the body, Alpha-Lipoic Acid buttresses liver health as a potent antioxidant aimed at eliminating free-radical agents in the body. Further, Silymarin is well known for its ability to neutralize common toxins through its display of hepatoprotective properties, which are well documented in the successful neutralization of hepatoxicity. Finally, Liver Defend supports the antioxidant enzyme, glutathione peroxidase, with the addition of the trace mineral Selenium.